Vannessa Hearman has received funding from the Australian Academy of Humanities, Asian Studies Association of Australia, the Australian National University and the Universities of Melbourne and Sydney. It was utterly predictable. In the increasingly tight race for Indonesia’s July 9 presidential elections between the two candidates, Prabowo Subianto and Joko “Jokowi” Widodo, it didn’t take long for allegations of communism to surface. A combination of intense advertising and a slanderous campaign by Prabowo’s team had slashed Jokowi’s two-digit lead in just two months. After spreading rumours that Jokowi is a secret Christian and of Chinese ethnicity, Prabowo’s campaign team recently attacked Jokowi and his supporters as having communist sympathies. Jokowi’s camp has rejected the allegation. To calm Islamic-base voters, they claimed that the teachings of the prophet Muhammad inspired Jokowi’s “Mental Revolution” manifesto. The use of New Order-era tactics of a communist scare and the reaction to it shows that Indonesia has much work to do to overturn the legacy of the past. In 1965-66, Major General Suharto oversaw the killing of some half-a-million members and sympathisers of the Indonesian Communist Party. The army accused the party of being behind a coup attempt in Jakarta. In the alleged coup attempt on September 30 1965, left-leaning army officers killed six generals. 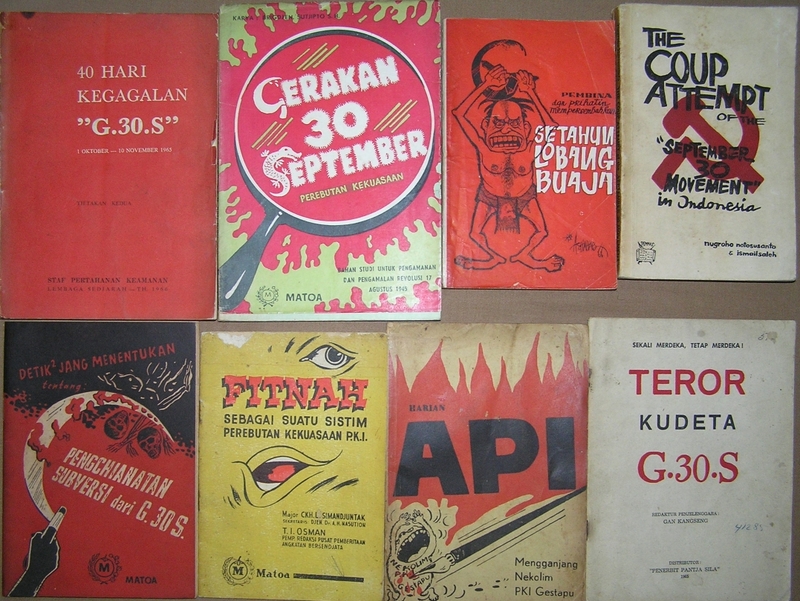 Books and films that shed light on Indonesia’s 1965 anti-communist killings emerged in the past decade, following the fall of Suharto, Prabowo’s former father-in-law, in 1998. Yet after 16 years of democracy, communism is still largely imprinted in the mind of Indonesians as the country’s bogeyman. There are several reasons for this. Perpetrators of the 1965-66 killings have never been held accountable. The victims and survivors have never been rehabilitated. The National Human Rights Commission ruled in 2012 that the killings were a gross violation of human rights. But the attorney-general’s office has refused the commission’s demand for further investigation. The 1966 parliamentary regulation that bans communism has never been repealed. The military, responsible for the pogrom, remains very anti-communist. Several Islamic organisations are also fearful of the “latent danger of communism”. Some Islamic groups and paramilitary organisations such as Pemuda Pancasila were involved in the killings. Today, groups such as the Anti-Communist Front support Prabowo. The presence of outspoken left-wing activists in PDI-P therefore has been used to fuel accusations of Jokowi and his supporters being communist. This was not the first time the PDI-P has been associated with communism. The Indonesian Democratic Party (PDI) is an amalgamation of Christian, Catholic and nationalist parties, formed in 1973 when Suharto’s New Order allowed only three parties to exist. In 1996, Suharto installed his man Suryadi as PDI chairperson through a rival congress, dismissing the leadership of first president Sukarno’s daughter Megawati Sukarnoputri. Megawati and her supporters set up the Indonesian Democratic Party of Struggle (PDI-P) in response. In July 1996, the police and military brutally attacked Megawati’s supporters who were occupying the PDI headquarters in Jakarta. The military found a scapegoat in a small activist leftist party, the People’s Democratic Party (PRD). The generals at that time accused the PRD of being communists. The government banned the PRD and imprisoned many of its members until 1998 when the New Order regime collapsed. While PDI-P, the winner of this year’s parliamentary election, remains dynastic at the leadership level, at the lower level it accommodates a range of progressive views. This has led to the charge that the PDI-P is riddled with “communists”. Former PRD chairperson Budiman Sudjatmiko is now a legislator under PDI-P. Sujatmiko’s presence earns many accusations of the party tolerating communists within. In May, he visited East Timor at the invitation of the Timorese government to discuss the role of village councils. Jokowi detractors have portrayed Sujatmiko’s visit as an attempt to consult “communist leader” Mari Alkatiri in East Timor. Another supposed communist is Ribka Tjiptaning, a 55-year-old medical doctor who previously headed the parliamentary committee on labour, citizenship and health. Her 2002 autobiography was sensationally titled I’m Proud To Be a PKI (Indonesian Communist Party) Child. In it, she relates how her father was accused of being a member of the PKI. A scare campaign has made out that Jokowi will make her health minister if he is elected president. PDI-P’s ties with military generals with questionable human rights records makes it a party that cannot be supported uncritically by human rights defenders. Activists also question Jokowi’s running mate, Jusuf Kalla, who was featured in the Oscar-nominated documentary The Act of Killing supporting the existence of paramilitary group Pemuda Pancasila. But Jokowi is the only candidate in this race who promises to resolve past human rights abuses, including the 1965-66 killings. Only then can the communist bogey perhaps be laid to rest in Indonesia. How will Indonesia’s president put together his new cabinet?